You are here: Home / Sponsored / Check Out Market Street! I was recently chosen as a Market Street Blogger and I am excited to share with you some of the great things about Market Street! Market Street is a unique, one-stop shopping experience that combines shoppers’ everyday grocery needs with the gourmet and specialty items, whole-health products, and freshly prepared foods they crave. If you’ve never been to a Market Street, then you are in for a treat. From the moment you walk through our doors, to the time our carryout clerks put the last bag of groceries in your car, – you will feel truly pampered. We strive to offer our guests the very best service – not just for a grocery store, but for any store. Market Street grew out of a desire to make life easier for our busy Guests who want to provide their families with high-quality, nutritious foods without spending their time running all over town. With one stop at Market Street, you can pick up chef-prepared meals to go, household necessities, gifts, locally grown and organic produce, and much more. We truly are like several stores under one roof. Our 12 Market Street locations can be found in Allen, Amarillo, Colleyville, Coppell, Flower Mound, Frisco, Lubbock, McKinney, Plano, and Wichita Falls. United, LLC, is a Texas-based, family-owned retail grocery chain with stores in 31 markets across north and west Texas. We are a self-distributing company headquartered in Lubbock with distribution centers in Lubbock and Roanoke. United operates 63 stores under five distinct formats: United Supermarkets, Market Street, Amigos, United Express Fuel and Convenience Stores, and Albertsons Market. 1. Texas Grown – all month long we celebrate our products made or grown in Texas. This includes everything from Texas BBQ sauce, to bakery items, beer/wine, produce and more. 2. 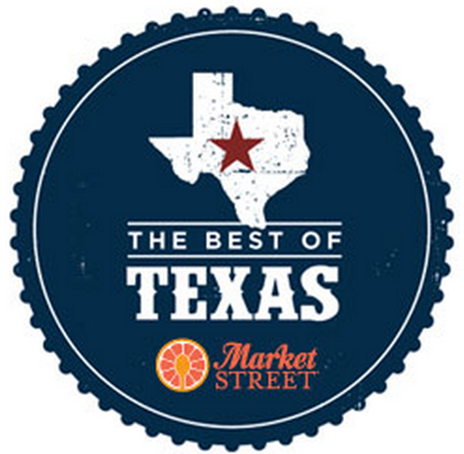 July 11 & 12 we host our “Best of Texas Expo” where we sample dozens of Texas items throughout the store. Please visit http://marketstreetdfw.com/bestoftexas for more details. 3. Highlight our beef selections, including our Genuine Texas Beef, USDA Prime, grass fed, certified Angus and Dry Aged Angus (available in Flower Mound only). 4. Highlight our Texas produce, including Texas cantaloupe and watermelon. We do not sell any GMO produce, and we always source produce locally before we look elsewhere. 1. The Flower Mound store is our latest location in the DFW area, and it has many exciting, new features, including an expanded health & wellness section, more bulk items, fresh sushi made every day, dry aged beef, and a large selection of gluten free products. 2. This is our only store to feature a wine bar. Guests can order from the specialized wine bar menu or pick-up their favorite Market Street Food-To-Go items and enjoy them in the bar or on the patio. 3. 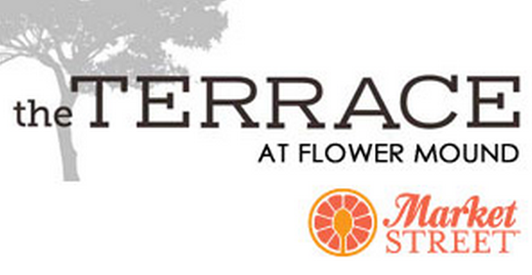 “The Terrace” is the official name for the patio at our Flower Mound store. It overlooks the playground area, and is an ideal place to grab a bite, let the kids play, and enjoy a sunny day. Guests can enjoy live music Friday nights during the summer, and drink specials from 4-7pm every day. 4. This store features a shaded outdoor playground adjacent to “The Terrace”. 1. Our Rewards program is designed help you save money on the items you buy most. The more you shop, the more you save. 2. Our Rewards program is completely digital. Select your digital coupons using our mobile app or our website. The coupons are automatically loaded to your account, and all you need is your phone number or alternate ID at checkout to redeem your coupons. 3. Rewards members can join our Kids Club where each child receives a FREE cupcake or piece of fruit for their birthday. 4. Members receive special, exclusive offers via email. 1. Our executive chef prepares a unique menu of “Living Well Favorites” items each season, like our seasoned salmon filet, ground turkey tacos and ginger cilantro pork loin. 2. Pick up a fast, nutritious dinner with our rotisserie chicken and side items. 3. Try our sandwich or burger selections for lunch. Our bacon is “to die for”. 4. Our “Texas Toss” salad is legendary and addictive. Ingredients: Romaine, grilled chicken, ripe tomatoes, brown sugar-peppered bacon, black beans, avocado, cheddar jack cheese, and chipotle salsa ranch topped with fried tortilla chips. So,now that we have introduced them to you, I will be sharing more info about Market Street from time to time here, so stay tuned!